Some time ago I wrote down my "bucket-list". On this list, "sky-diving" and "picking olives on Ikaria" are among the priorities. For several reasons, I have been good at postponing both, but this summer I spread the word on the platia that I would be back for the olives. Big smiles were the answers and it looked like nobody really believed me that I would quit the city to come back during winter to spend my time among the olive trees. And perhaps they would have been right, had I not got a message from Lefteris, a good friend, talking about his difficulties with the olive harvest. He was by himself and had already spent two weeks in his fields. There seemed to be no end to it. It was a kind of wake-up call for me … the call I was waiting for. I was stuck in the office, heavy work load, Christmas approaching and all the hustle and bustle that goes along with it. I needed an escape and the idea of "going to the olives" seemed like a perfect exit-strategy. So I booked my tickets and a short time later landed in a different world. When I arrived, Ikaria was still under a blue sky, temperatures like those of early spring and the villages completely quiet. No never-ending "Jingle-bells" and "Last Christmas I gave you my heart" sound tracks all over the place. Instead: the winter rhythm in the villages, with the regular coming and going of people off to town or to the fields. In the early morning, the older guys, clad in ancient jumpers, jackets and caps, were sipping their coffees near the fire-place before heading to the fields. As far as I could understand, most of their conversations were about the results of the olive harvest. It looked like it was a good year for most of them. Some people were surprised to see me, but gave me a smile: "So you really came back for the olives? Good for you". Just hours after I had opened and cleaned the house, I gave Lefteris a call to let him know that my hands were ready to work in the olive trees. I think he had some doubts as to how serious I really was, and offered me a broad variety of excuses for NOT coming to the fields. The first day was his name day - a perfect occasion for taking a day off to celebrate with friends and family. Instead of going to the olives I helped him prepare the party and afterwards we had a good time with plenty of food and wine. The next day I got up early, calling my friend at 8 a.m. asking him: "So when do we start? Where should I come?" Lefteris's answer was hesitant: "There might be some rain today. Are you sure you want to come?" These questions left me a bit puzzled – why shouldn’t I come? But as I can be very stubborn, I ignored these thoughts and just asked for the directions to get to the field. A little while later I found myself surrounded by about fifty olive trees. Some of them had already been harvested and the olives were neatly packed in big bags, waiting to be transported to the olive mill. Under some trees, Lefteris had already spread out the standard green nets. He put a little yellow fork in my hand and with the words: "I prepared a tree for you", guided me to an olive tree. Compared with all the other trees, you could call this tree a “baby tree”, as it was a small one with easy access to its fruits. Lefteris gave me a short introduction on how to "comb" down the olives. Under his eyes I made my first movements, anxiously checking that the olives were finding their way into the net and not bouncing around it. After some corrections to my "combing" technique and some further instructions on how to arrange the net, Lefteris left me alone, continuing his work under the other trees. So here I was: standing under an olive tree, trying to find the best positions to grab the branches so I could comb the olives. At the same time I tried to pay attention not to step on the olives already gathered in the net. From afar, it might have looked as if I was inventing a new sport – a cross between dancing steps, yoga movements, stretching my arms into the air, and rock-climbing, with my feet searching for a stable position on the rocks. Without seeing him I knew that Lefteris was observing me, so I rose to the challenge. After a little while, I found my rhythm. My busy mind slowed down: I was just concentrating on the olives and the olives only, where to find them in the branches and how to get them down. My movements became monotonous and this was a nice relief for my body. All my senses were heightened: the winter smell of the earth and olives, the smoke of the wood-fires lit in the houses nearby; the voices of the people in the fields around. I could not see them, but their long "Heeee!" shouted out loud from time to time was the sign that other human beings were still around. After a while, I became lost in time and space … perhaps the best lesson in mindfulness and meditation I could ever have. I recognised the beauty of the different colours of the olives and the shapes of the trees. I recalled the ancient stories I had heard about the olive tree being the most precious gift the gods could offer to the people … and finally I could understand its meaning not only with my brain, but with all my senses and my heart. After the first day, the result of the harvest was not really satisfactory. I think I was too slow and too accurate, spending a lot of time picking the olives even with my fingers from the upper branches. But Lefteris winked at me and said: "Tomorrow is another day". And indeed, the next morning: same procedure. I showed up at the field by 9 a. m. and had my first coffee with Lefteris and some of his friends who were passing by to help. Later on, I found myself on my knees, cleaning the olives from the leaves and branches and putting them into the bags. Obviously I had entered phase 2 of the olive harvest lesson. Very quickly I got back into my monotonous movements, which seemed to be quite healthy for a city girl like me, because it demands your full attention. Once you are into it, there is no time for selfies or flipping around on your mobile phone, checking mails and messages at the same time. It may not look like it, but picking olives is demanding and requires you to finish the job. So I followed the call. I had a little chit-chat with the guys around me – most of them over 70 – and was impressed by the ease with which they got up and down on their knees and heaved the heavy bags onto their shoulders. I tried to follow them with the same easy movements, and was happy that I still could. At lunch-time Lefteris had to "pick me" from the olive tree. I had been focusing so much on the hidden fruits in a big tree that I forgot to notice my hunger and my aching back. I was rewarded with the best coffee, bread and cheese I had ever had. In the late afternoon I was ready for phase 3 of the olive exercise: pressing the oil at the mill. Neighbours and cousins arrived with their cars and helped to load the bags on the pick-ups. Together we drove to the olive mill in Chrisostomos, where Nikos is able to press the oil at 28 degrees – this cold-pressing procedure ensures a high quality of oil. We arrived in early afternoon, just six people waiting ahead of us in the queue. But what initially looked simple to me turned out to become a long procedure. I had to learn that the olive mill may easily become a waiting-room where you can spend a lot of time … depending on who might be in front of you in the queue. If you arrive after someone who is bringing in 900 kg of olives to be processed, you take your time. And that is exactly what happened. At first I felt insecure, not knowing what to do. The people were sitting around, smoking, chatting slowly. Others were making coffee or just sleeping on the sofa. People took it easy: nobody was irritable, no constant checking of mobiles, no loud telephone calls, no arguing with the owner to hurry up. People were just waiting, waiting however long it took until it was their turn. I was impressed – what a different world! But this was also the moment when my "business" mind switched on. Perhaps I should go back to the field and continue picking while Lefteris was waiting here? This could help save some time and we could finish with the olives some hours earlier. But even before opening my mouth and suggesting it to Lefteris, I recognised that I had been about to fall into a trap, the trap of my "European" way of thinking. 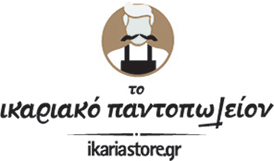 An inner voice whispered to me: "Remember, girl, you are on Ikaria. So just do what the others are doing. If it was necessary to go back to the field, they would let you know. But they haven't, so just sit down and drink your coffee". And that is what I did. I sat down, talked to the others, watched the processing of the olives and even fell asleep on my chair, as the others did. 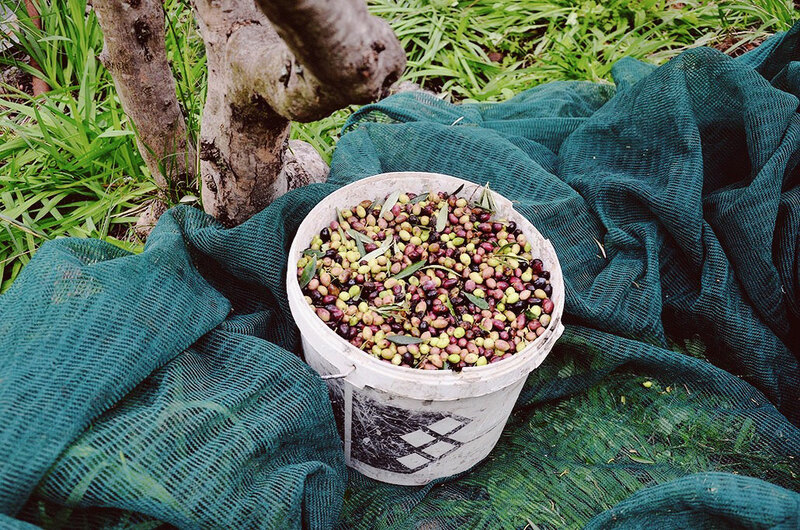 Perhaps this is one of the nicest parts of the olive picking. Waiting at the olive mill finally gives your body the rest it needs to recover in order to continue the harvest….it was here at this mill that the best balance between work and rest took place. Finally, after hours, it was our turn. Phase 4 of the olive harvest was about to start. With great pleasure and pride we put our olives on the belt and followed them through the different stages of the process: the washing, the squeezing, the separation of the oil to its final stage: the bottling of the fresh oil into the canisters. What a pleasure to see Lefteris at the final station of the processing machine. He was sitting on a chair, placed like a throne, cautiously opening the tap, with the first drops of olive oil dripping down. The colour of the oil was a mixture between dark green and yellow – a good sign of its high quality. For sure: it will be the pride of the family. And I got an extra goody: Nikos poured some fresh oil on a piece of bread and put some salt on it. He passed it to me, serving it with some Tsipourou. It was a feast for my palate – forget about Easter or Christmas menus if you can have this instead! In total, the result of this first olive pressing was good. My "European" mind calculated the price you could get selling this quantity of oil in the big city. So I asked the guys around me what they were going to do with their oil. Stupid me! I should have known better, because the answer was straight and simple and certainly the same one that their ancestors would also have given before them: we give it to family and friends. And of course the people who had helped with the harvest would get their share. This is the tradition. Another lesson learned: sharing is caring. So at the end of the day, I reached phase 5 of the olive harvest lesson: getting my share of olive oil. Before leaving the island, Lefteris gave me some plastic bottles filled with olive oil. What a precious gift! Our hands had worked on it. And as I was travelling the "Greek way" I brought this oil home to share with family and friends. The oil will tell them the story of some winter days on Ikaria. My interpretation of the story is a very short one: go to the olives, because the olive has it all. It will teach you about mindfulness, meditation, appreciation of the land that nourishes you, it gives you physical exercise and you will understand the structure of a society living on an island. You can also choose to read a thousand books on these subjects or you may spend your money on seminars, but to my way of thinking: pick an olive … it is enough to understand.